The deep fibular nerve (deep peroneal nerve) is a nerve of the leg. It is one of the terminal branches of the common fibular nerve. 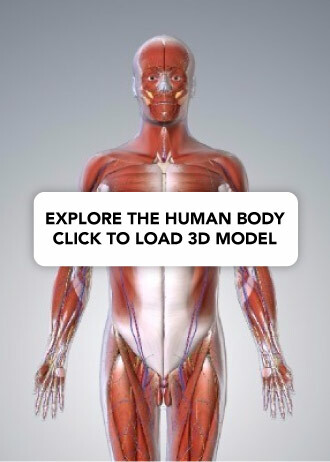 In this article, we shall look at the anatomy of the deep fibular nerve – its anatomical course, motor and sensory functions, and any clinical relevance. Motor function: Innervates the muscles in the anterior compartment of the leg, as well as some of the intrinsic muscles of the foot. Sensory function: Supplies the triangular region of skin between the 1st and 2nd toes. The deep fibular nerve originates from the sciatic nerve. The sciatic nerve bifurcates into the common fibular and the tibial nerves at the apex of the popliteal fossa, at the back of the knee. 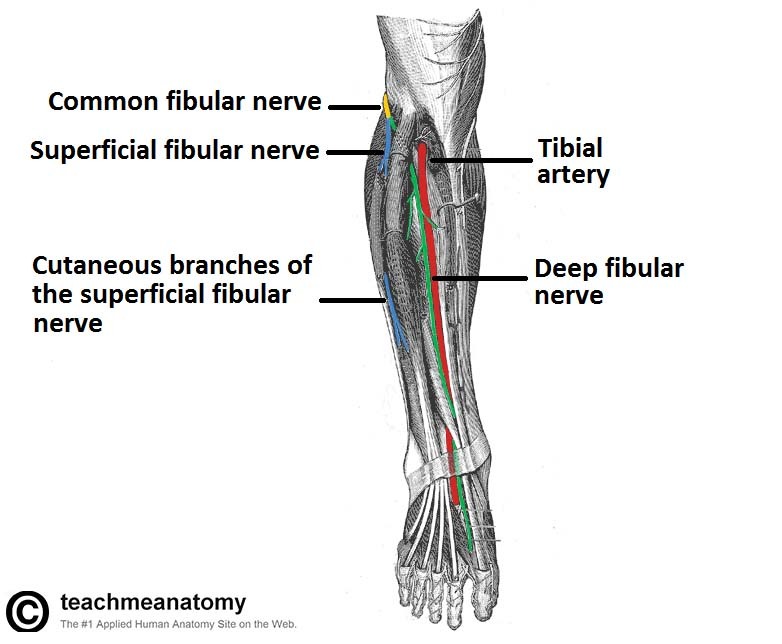 The common fibular nerve wraps around the neck of the fibula, moving anterolaterally, and gives rise to two terminal branches: the superficial and the deep fibular nerves. The deep fibular nerve arises in the superolateral aspect of the leg, between the fibularis longus muscle and the neck of the fibula. The nerve moves from the lateral compartment to the anterior compartment of the leg. It then follows the course of the anterior tibial artery, in an inferomedial direction. Together, the two structures pass between the TA (tibialis anterior) and the EDL (extensor digitorum longus) in the superior portion of the leg, and between the TA (tibialis anterior) and the EHL (extensor hallucis longus) in the inferior leg. A medial branch: A cutaneous nerve, innervating the skin between the 1st and 2nd toes. Fig 1 – Anterior view of the leg, showing the major nerves. The proximal portion of the fibularis longus has been removed to show the bifurcation of the common fibular nerve. When a person strikes their heel on the floor in the stance phase. The deep fibular nerve also innervates the extensor digitorum brevis and extensor hallucis brevis, which are intrinsic muscles of the foot. These muscles are responsible for extending the toes at the metatarsophalangeal joints and interphalangeal joints. 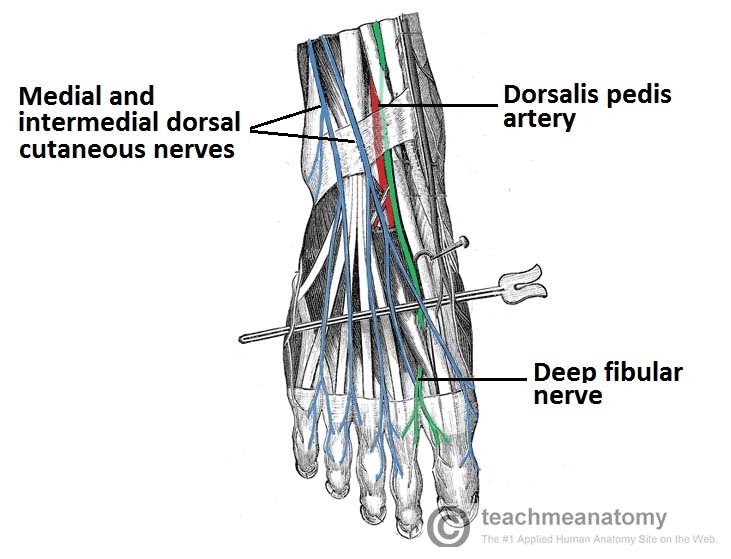 The deep fibular nerve terminates in the dorsum of the foot as a cutaneous nerve. This innervates the webbed space of skin between the great toe (hallux) and the second toe. The deep fibular nerve can become entrapped or compressed during its course through the anterior compartment of the leg. This causes paralysis of the muscles in the anterior compartment of the leg, and so a patient loses the ability to dorsiflex the foot. With unopposed plantarflexion, their foot drops. Footdrop gives the patient’s foot difficulty in clearing the ground during the swing phase of walking. In addition, the foot will slap down on the floor when the patient walks, because it can’t be lowered in a controlled manner. There are two main reasons why the deep fibular nerve could be compressed. The first is that the anterior leg muscles have been excessively used and so are compressing the nerve within the anterior compartment. 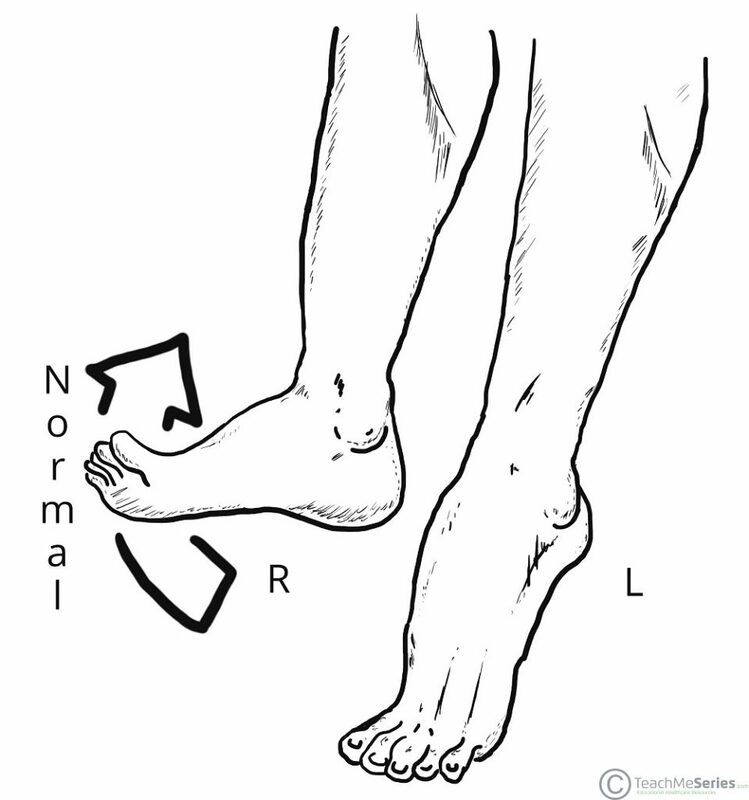 The patient will experience pain in the anterior leg. The other common cause is tight-fitting shoes, compressing the nerve beneath the extensor retinaculum. This commonly occurs with wearing tight ski boots (referred to as ski boot syndrome). The patient will also experience pain in the dorsum of the foot. What are the spinal roots of the deep fibular nerve? Which artery does the deep fibular nerve follow as it descends inferomedially along the leg? Which structure does the deep fibular nerve pass under at the ankle joint?